Are you looking for a meaningful way to give back while on Alternative Break? 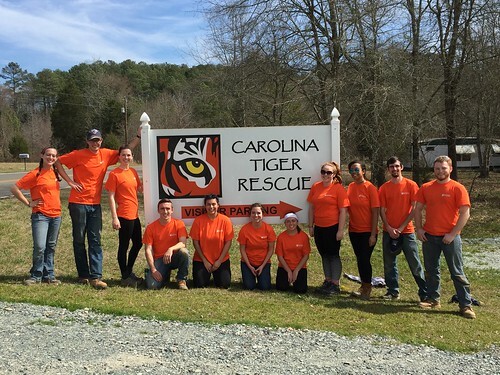 Carolina Tiger Rescue happily hosts Alternative Break groups from around the country throughout the year. ASB volunteers fulfill a critical role and assist with a variety of different projects. They work directly with our site manager and construction assistant to help us build new enclosures, keep up with grounds-keeping activities, and help us with general maintenance projects throughout the sanctuary. Groups typically work Monday-Friday 8:30am-5:00pm, but scheduling is flexible if necessary. In addition to being able to work in close proximity to tigers, lions, cougars, and other powerful carnivores, each group will be provided a complimentary tour of the sanctuary. Groups may be as large as 25 people – special accommodations can be made to allow for additional participants, but this requires specific permission from our Site Team and must be done at the time of your reservation. Please keep an eye on the weather forecast for Pittsboro, NC in the days before your visit. All construction activities are performed outdoors, rain or shine. Please dress and pack accordingly. Carolina Tiger does not offer housing or transportation for participating ASB groups. Are you ready to book? Make your reservation today! Do you have more questions about Alternative Break opportunities? Reach out to our Program Assistant for additional details!